Are you interested in the archaeology of Chester? Would you like some hands-on archaeology experience but don’t have time to volunteer during the week? On Saturday 4 August 2018 12 noon – 4pm the Grosvenor Museum will be running a finds washing session in the Grosvenor Park Activity Zone. We will be washing finds from the HQ site in Chester where excavations uncovered the remains of Roman buildings, a medieval nunnery and an early post-medieval house. No experience necessary there will be trained archaeologists to tell you what to do. Please bring rubber gloves and an apron or wear clothes that you don’t mind getting dirty. You must be over 16 to take part. The Grosvenor Museum is starting a new project on Friday 3 August 2018 which aims to bring a large archaeology project archive up to a condition that meets museum deposition and Historic England’s accessible archive standards. 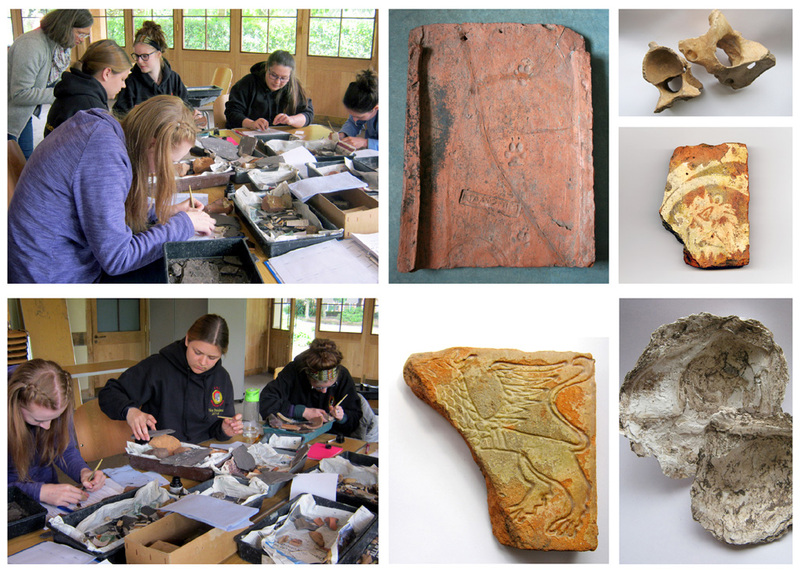 The first stage of the project consists of a programme of finds processing and we will be based in the Pavilion in the Grosvenor Park Activity Zone where we will be washing, sorting and re-boxing finds from the 2007 excavations at the HQ building in Chester. These significant excavations uncovered the remains of Roman buildings, a medieval nunnery and a 16th/17th century house and produced a rich and plentiful finds assemblage. The finds we will be washing will be largely Roman and later building materials e.g. roof tiles, floor tiles and bricks and animal bone and also some pottery. We will be sorting and boxing these and other finds from the site by material and period and carrying out basic documentation. There is a good assemblage of animal bone from the site and we are arranging for a specialist to run a workshop on identifying animal bones during the afternoon of Wednesday 8 August. In order to be eligible to attend the workshop you must first attend the washing session in the morning or a session on one of the preceding days. If you would like to come and help please email julie.edwards@cheshirewestandchester.gov.uk with the dates and times you are able to attend. 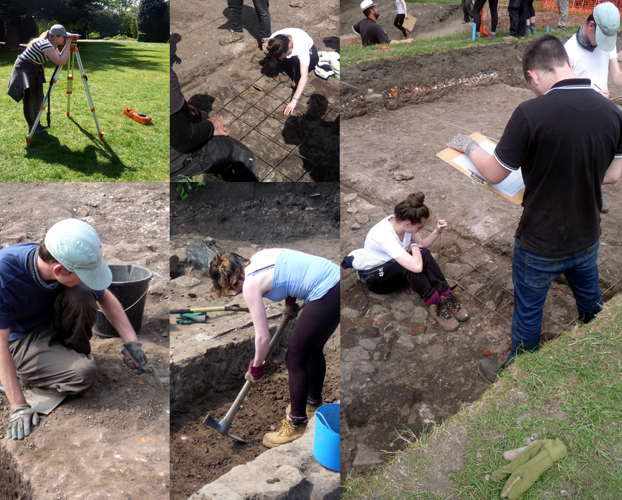 Archaeologists from Cheshire West and Chester Council Cultural Service (Grosvenor Museum) in partnership with the University of Chester, returned to Grosvenor Park, Chester to run their annual training dig for second year students, an essential part of their archaeology degree course. An OPEN AFTERNOON will be taking place on May 29 between 1:30 – 4:30pm giving you the last chance this year to see what the students have uncovered, study the objects they have found and learn more about the history of this corner of Chester, and it’s FREE! So far the students have uncovered, amongst other things, a Roman road that led to the east entrance of the amphitheatre and a large building destroyed during the Civil War. The building appears to have been a part of the medieval hospital and chapel of St. Anne which was acquired by Sir Hugh Cholmondeley in the late 16th century and developed as part of his mansion house. The last day of the dig is Wednesday 30 May and it will close at 4:30pm. The Chester Archaeological Society Conference will be held at the Grosvenor Museum on the 29th and 30th June 2018. For more information about this event visit the Chester Archaeological Society website. Chester Heritage Festival will run from 22nd to 30th June. It will feature walks, talks, films, exhibitions, workshops and special activities for young people which bring Chester and its heritage to life. The festival is being co-ordinated by Chester Civic Trust and Cheshire West and Chester Council in close partnership with many other groups such as the Guild of Tour Guides, Roman Tours, St John’s Church, Chester Race Company, the Grosvenor Museum, Storyhouse and local libraries. Over 60 events will take place around the clock, across the city and beyond. 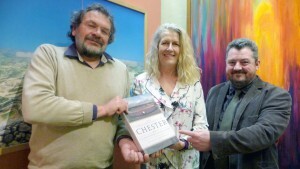 Visit www.visitcheshire.com/chesterheritagefestival or look out for leaflets around the city and in libraries throughout Cheshire West when the festival programme is published in May. 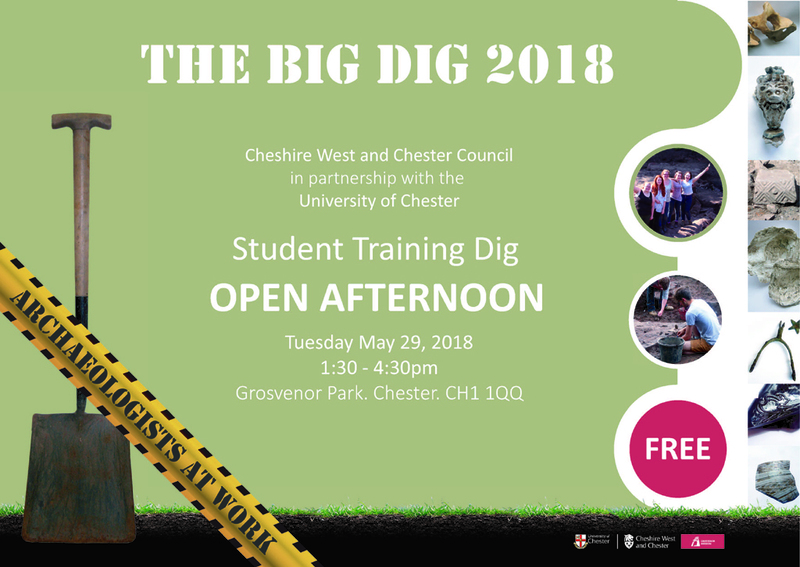 Archaeologists from Cheshire West and Chester Council will be returning to Grosvenor Park, Chester to run their annual training dig for second-year archaeology students from the University of Chester. Why are they digging in the park? Grosvenor Park sits next to two important historical monuments, the Roman amphitheatre and the medieval church of St John the Baptist. Both of these have had an influence on the development of the park and, more importantly, on what lies beneath. For example, written records tell us that Cholmondeley’s Mansion and buildings belonging to St John’s Church were located in the park but how much remains and what did these buildings look like? Chester’s Roman fortress, which lay to the west, would have been surrounded by a civil settlement. Does any of that survive? So far the students have uncovered a Roman road, a large building destroyed during the Civil War and a wide ditch running north-south across the park. The building appears to have been related to St John’s Church, probably part of the medieval hospital and chapel of St Anne, which was acquired by Sir Hugh Cholmondeley in the late 16th century and developed as part of his mansion. This season they hope to discover more about the layout of the medieval building and its post-medieval successor and to find further evidence for the civil settlement outside the Roman fortress. The training dig will be open for viewing by the public from May 3rd to May 30th, 9.30am to 4.30pm Monday to Friday (except between 12.30pm – 1.30pm daily and all day on Bank Holiday Mondays). An Open Day will be taking place on the afternoon of May 29th (1.30 – 4.30pm), giving members of the public the chance to see first-hand what the students have uncovered and learn more about the history of this corner of Chester. Further information and updates will be available on the students’ Dig Blog during the excavation. Archaeologists undertook a major excavation of Chester’s Roman amphitheatre from 2004 to 2006. The Roman Amphitheatre of Chester Volume 1: The Prehistoric and Roman Archaeology was launched last week at Chester’s Grosvenor Museum. The excavations revolutionised the understanding of the scale and grandeur of these buildings, and of the activities that took place in the arena and around the amphitheatre. The excavations were funded and managed by Historic England (previously English Heritage) and the former Chester City Council. In addition to receiving interest from residents and visitors to Chester at the time, the excavations attracted national and international attention. BBC Timewatch featured the excavation in the programme Britain’s Lost Colosseum. Tony Wilmott, Senior Archaeologist with Historic England and Dan Garner (formerly of Chester City Council), are the authors of this first volume and were co-directors of the excavations. Tony was voted Current Archaeology’s ‘Archaeologist of the Year’ in 2012. Councillor Louise Gittins, Cabinet Member Communities and Wellbeing said at the launch: “The project provided a fantastic opportunity for local volunteers and the wider community to get involved, they were able to gain experience of working on site and in finds processing, whether experienced or new to archaeology. The vast and complex task of analysing what was discovered over the course of those excavations has been carried out by Historic England, by our skilled and hugely knowledgeable archaeologists from Cheshire West and Chester Council and by specialists across the UK. The book describes the elaborate structure of the amphitheatre and includes some amazing reconstructions of how it almost certainly looked. It also provides a fascinating study of early Roman occupation of Chester, and tells the story of the site from the around 6,000 BC to the end of the life of the Roman amphitheatre. The Roman Amphitheatre of Chester Volume 1: The Prehistoric and Roman Archaeology is available from the Grosvenor Museum and from Oxbow Books. Chester’s walls have just got chatty! Pass a ‘Talking Wall’, swipe your phone on a nearby plaque or type the short url, and presto: your phone rings. It could be Chester Cathedral on the line, or the Booth Mansion, or the Grosvenor Museum! Using drama, off-the-wall humour and mobile technology, Talking Walls breathes new life into the walls that surround us all. Talking Walls Chester is brought to you courtesy of CH1ChesterBID who represent over 500 city centre businesses. The project is produced by Sing London – the people who brought Talking Statues to the world. Archaeological excavations in 2001 and 2002, in advance of an extension to the Debenhams store, uncovered a wealth of evidence for 2,000 years of Chester’s history. The site was behind the shops on Bridge Street Row and Eastgate Row, in the heart of the medieval city and the Roman legionary fortress. A wide range of artefacts were found, including rare types of Roman roof tile, Spanish mackerel bones, glass goblets and an elephant bone! 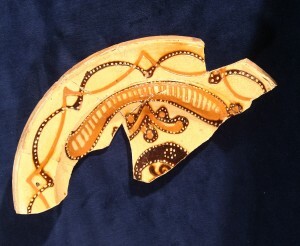 A late 17th century slipware dish – one of the items on display. 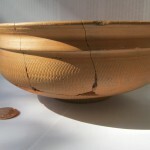 It has been skilfully decorated using dark brown, orange and white slips. It could have been made by one of the well-known slipware potters of Staffordshire. A small selection of the artefacts is now on display in the Newstead Gallery at the Grosvenor Museum. 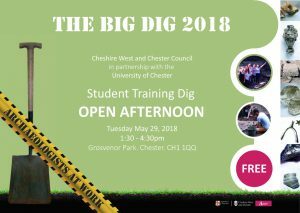 Since 2007 archaeologists from Cheshire West and Chester’s Cultural Service, in partnership with Chester University, have run an annual training dig in Grosvenor Park, Chester, for the second-year archaeology students. The dig aims to find out more about the area surrounding the Roman amphitheatre, to explore the past of the park and to give students the important excavation experience they need to gain their degrees. Some of the thousands of artefacts recovered during the excavations are now on display in the Newstead Gallery at the Grosvenor Museum. 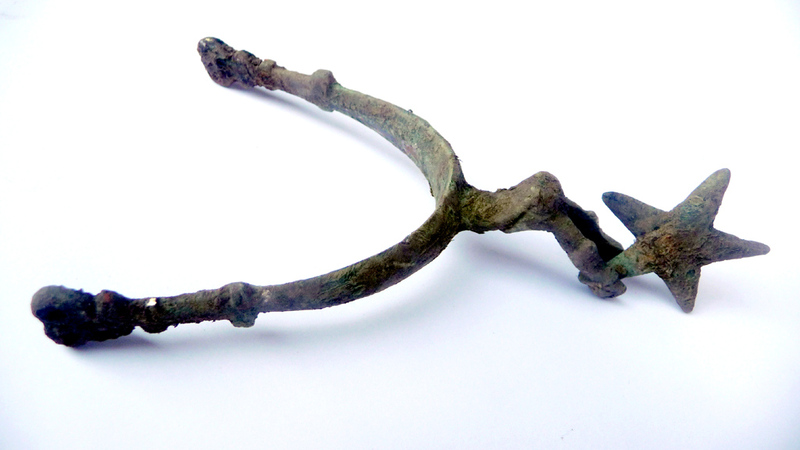 A seventeenth-century spur with a star-shaped rowel – found during this year’s training excavation. * the thick stone walls of a medieval building. Though most of the stone had been robbed out from the medieval building, it is believed to be part of the north-eastern corner of the precinct of the church of St John the Baptist; perhaps the hospital and chapel of the Fraternity of St Anne which was acquired by Sir Hugh Cholmondeley in the late sixteenth century and converted into a large house, later destroyed in the Civil War. The ditch may be the early boundary of St John’s Precinct. The students have made a blog that relates their experiences and discoveries over the years and includes photographs of the archaeological remains. Archaeologists from Cheshire West and Chester’s Cultural Service are pleased to announce the publication of The Roman Amphitheatre of Chester Volume 1: The Prehistoric and Roman Archaeology. This is the first of two volumes dealing with the major research excavations on Chester’s amphitheatre which took place between 2004 and 2006, funded by English Heritage and Chester City Council. We know that the first amphitheatre was built in the 70s AD. It had a stone outer wall with external stairs and timber-framed seating but more fascinating is the fact that the second amphitheatre was built around the first. The second amphitheatre, probably built in the later second century, was the largest and most impressive amphitheatre in Britain, featuring elaborate entrances, internal stairs and decorative pilasters on the outer wall. Beneath the seating banks evidence for prehistoric settlement was recovered – the first substantial prehistoric archaeology to be found anywhere in Chester. 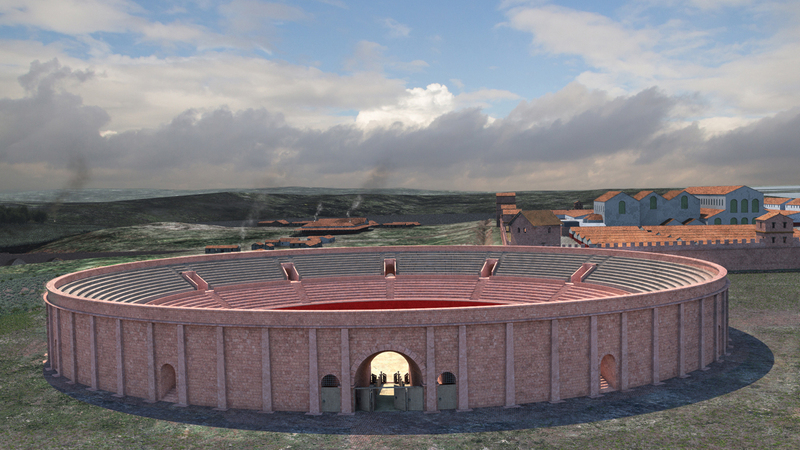 We are now working on Volume 2, which will deal with the robbing and reuse of the amphitheatre after the Romans, and the development of the medieval and post-medieval urban landscape of the site. Volume 1 can be ordered from Oxbow Books. 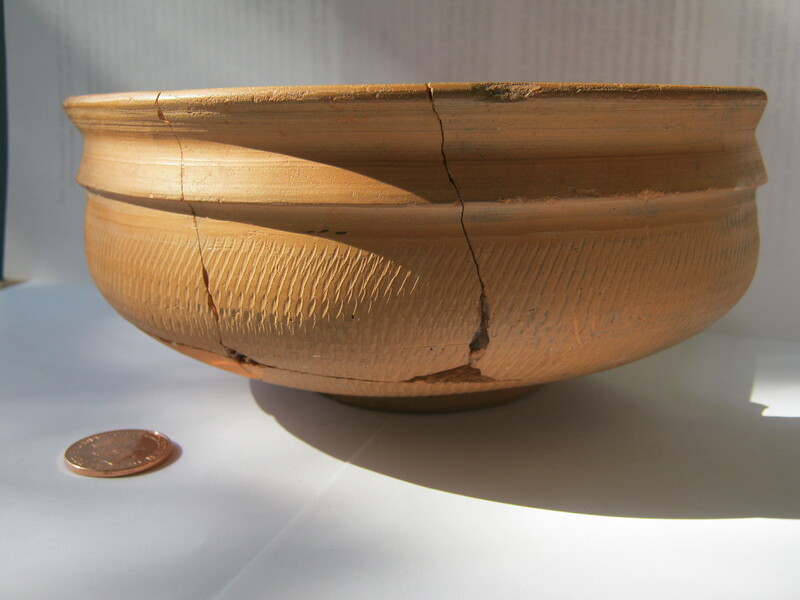 A Roman bowl from the legionary kilns at Holt (c 90-135). Found at Abbey Green, Chester, 1975-8. Chester is one of Britain’s most important historic towns and is the product of nearly 2,000 years of activity. Its history survives both in its buildings and as complex archaeology. Between 1970 and 1990, the local authority carried out a large number of excavations, some of which have been published and the archives put in order. However, not all of these meet current standards of packaging and storage, so a project has been set up to address this, with museum archaeologists carrying out the work. The Historic England-funded project is designed to secure the future of Chester’s archaeological resource. This includes documents, objects, drawings, photographs and digital files. It is not only a research resource of major significance; it will also help inform the future management of the city’s archaeology.